About: Popular with tourists, St James Tavern, formally a listed building, is a pub that serves a variety of traditional pub meals. They also have a late license. Popped in for a quick pint early Saturday evening. A nice place with a 'local' feel and friendly bar staff. No loud music or TV which is appreciated. Could do with a larger range of beers on draught. Thanks for a lovely experience in London. This was my first trip to UK and I'm going back in january or february -09 with my friend. 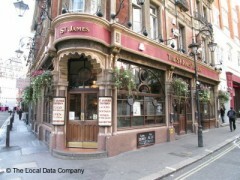 St James has a truly nice staff and good food. I hope I'll be able to make a visit soon. Great night out - Thanks Paul for South Africa & Phil from Canada, you guys made out experience GREAT!